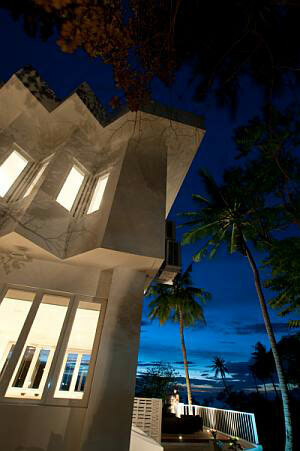 Villa Romonea stands tall and proud on a beautiful spot besides the ocean on the southwest coast of Cambodia. Gleaming white, its modernist curves and angles reflect the strong rays of the early afternoon sun, making me reach for my sunglasses as I marvel at its smooth lines. “It’s designed like a dragon,” explains Stephane, pointing towards one side of the property which protrudes out at the top. I squint to try and envisage the dragon a little bit better. “It’s all about Feng Shui,” he explains as we walked into the impressive hallway. The dragon is a sign of prosperity and good luck in Khmer culture, he continued, so the master bedroom is located in the dragon’s head. As I listen my eyes try to take in the huge hallway, which is impossible without turning my head a full 180 degrees. A curvaceous sweeping staircase dominates the handsome, light and airy space, with a bannister weaving its way up the stairs and wiggling across the landing. Meanwhile on the ground floor, looking straight ahead through the large ceiling-to-floor glass doors, lies the infinity pool in spacious gardens with the ocean beyond. This is an image of Cambodia in its heyday, a time not all that long ago – but before the country was ravaged with civil war and genocide. 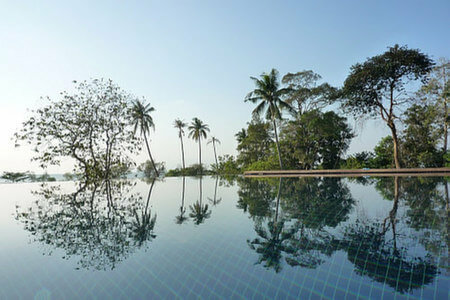 When Villa Romonea was built in 1968-69, Kep was the ultimate seaside retreat for the Khmer and French elite. More than 1,000 luxurious villas were positioned along the coast – each finer and grander than the last. Villa Romonea, designed by Lu Ban Hap, was one of the last ones to be built, so also one of the finest, Stephane adds with a sense of pride in his voice. 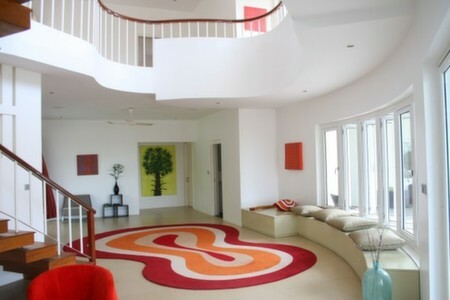 Today Stephane is the manager of this striking 6-bed hotel, which blends curves, angular lines and zig-zags seamlessly. When I met Stephane after a party of holidaymakers had just checked out, the doors and windows were all open allowing the air to circulate through the buildings and into the freshly cleaned bedrooms. There was some banging from the huge modernist kitchen to the right as the last of the plates were put away in preparation for the next guests. “The kitchen is free for everyone to use,” he explained. 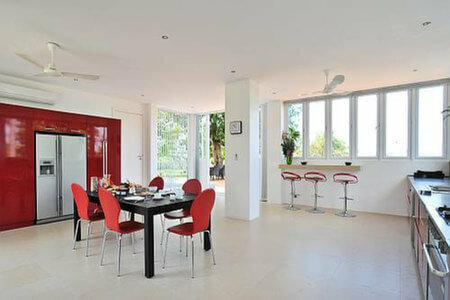 It serves as the cooking space, the eating space, the ‘just hanging out’ space if you wish – in that way that only a truly fabulous, big kitchen can pull off. But if cooking on holiday is not your thing, then fret not – Stephane works with eight great seafood restaurants in the area that will deliver their freshest dishes piping hot. But the villa has not always gleamed and shined in this way. If walls could talk, these walls would tell a rather more somber and tragic tale. Originally owned and built by a local woman who lived nearby, she only lived in the building a few years before the Khmer Rouge invaded. Along with most locals, who had a degree of wealth or education at the time and did not manage to flee, she was executed by the brutal soldiers who claimed to be ‘liberating’ the country under Polpot’s crazed regime. Over the course of just four years, from 1975 – 1979, the Khmer Rouge wiped out almost two million people – almost a quarter of Cambodia’s population. The troops rolled into Phnom Penh ordering the city to be evacuated, claiming ‘American bombing’ was imminent. Families packed small bags and made their way out to the country by whatever means they could – those that were lucky enough to have vehicles only got as far as petrol would allow before they joined their fellow evacuees on foot. After walking for days, even weeks, thousands of citizens found themselves completely displaced, families torn apart, children lost. Those with the wrong accents or skin a shade lighter than the rest would fare the worst. The victims who were not bludgeoned or shot to death died from disease, starvation or sheer exhaustion in labour camps in the years to come. But Villa Romonea stood her ground. Her owner was executed, and her children are said to have fleed successfully but she stayed put. Her white paint lost its shine, the walls soon bore the wounds of artillery fire and instead of a home of peace, she became a military base for the team of Khmer and Vietnamese soldiers who would eventually emerge triumphant over the Khmer Rouge. She saw it all. And like all Cambodians that survived these atrocities she emerged battered and bruised. Looking at pictures of the villa, taken just seven years ago before renovation work took place, it’s hard to believe I was sitting in the very same place. The pictures reminded me of a skeleton. Her now pristine white walls were stained black with dark holes for windows, like sockets without eyes. Some parts of the walls were incomplete, although Stephane said largely the structure remained unscathed. To me the pictures showed a building that looked more suitable for demolition than resurrection. But I suppose that’s Cambodia in a nutshell today. Coming from Vietnam, the poverty in Cambodia is immediately apparent, and while I cannot profess to be an expert in the slightest, I am sure that having the majority of your professional population stripped by genocide and using any wealth on arms, must play a role in its economy still today. But just as Villa Romonea has been lovingly stitched back together to resemble that fiery dragon once more, so has Cambodia. The scars can still be seen, even if the wounds are healing, but it is a country on the mend. And it’s mending with a smile. PS None of these fabulous pictures have been taken by myself (I was too busy gawping and asking questions) they have all been ‘borrowed’ from Villa Romonea’s mighty fine website. This entry was posted in Cambodia, Recent Posts by Delia. Bookmark the permalink. Fantastic article. Sums up the feeling of Kep, and Cambodia, very well. I’m a little disappointed we didn’t come across this villa in our travels!